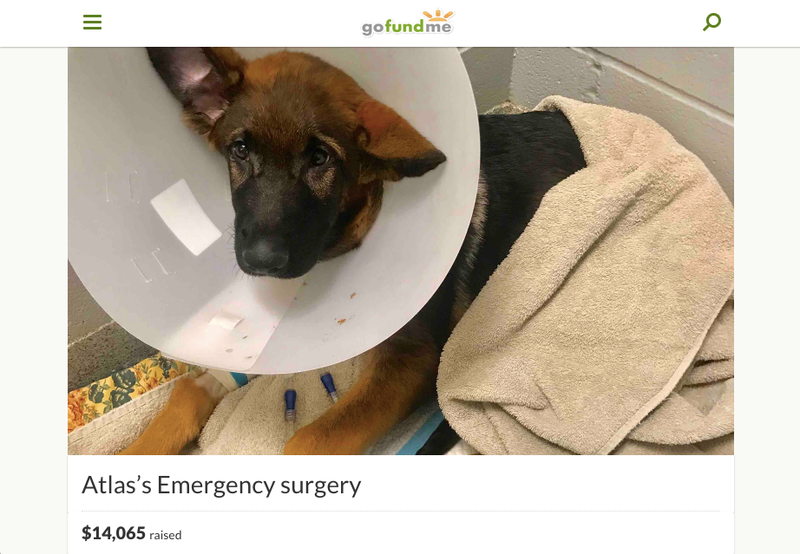 A GoFundMe fundraiser for a German shepherd puppy’s emergency surgery reportedly received nearly 700 donations over 28 days, totaling $14,065. But police now say the dog’s owner intentionally caused the injuries and GoFundMe has promised to refund the donors. The 5-month-old dog, Atlas, died on February 3rd. When the dog’s owner, 24-year-old Reid M. Herjo, was stopped by police in Medford, New Jersey in January, Herjo said that Atlas needed to go to the vet after being hit by an ATV, according to the Courier-Post. But a few days after police pulled him over, they got a tip that Herjo had harmed the dog on purpose, leading them to open an investigation. Investigators say they learned that Atlas had been abused at least two other times in a six-week span, causing fractures and hemorrhaging. Herjo allegedly said that the dog fell down the stairs and a hill. According to police, the dog then died “under suspicious circumstances as there was evidence Atlas sustained additional trauma,” NJ.com reports. Reid has been charged with animal cruelty and theft by deception. A GoFundMe spokesperson told the Courier-Post that all donors would be refunded as Herjo had violated the site’s terms of service. Herjo is also banned from GoFundMe, and the crowdfunding site says it’s working with investigators.